Over the past few days, I've done reporting on Sarah Palin's extensive dominionist connections--including the attempt to run her as a "stealth" dominionist candidate and her connections to some scary dominionist groups including not just "Joel's Army" folks but a far-right Christian Reconstructionist political party linked to domestic terrorism. As bad as all this--and the scandals regarding her misrule in both Wasilla and as state governor--are, there's apparently still more. Today, we find that part of those funding scandals include the tax money of Alaskans used to pay for youth programs at Juneau Christian Center. We also reveal info regarding a particularly disturbing Assemblies frontgroup Palin recently did a talk at, and we go into researching the dominionist connections of her most recent church--Wasilla Bible Church. In another example of what appears to be some extensive whitewashing at almost all of Palin's former and present churches, there were some very interesting links removed from JCC's site regarding an interesting bit of largesse by Sarah Palin to the church. Fortunately, an astute blogger happened to archive the material, which included not only documentation of a $25,000 grant to JCC's "The Hub" from Palin's administration, but also a request for $100,000 total in state and federal funding and pictures of Palin actually being at the opening of "The Hub" (which have since been scrubbed from her website). And all is definitely not as it seems with "The Hub". "The Hub" is essentially a frontgroup run by JCC for recruitment of future members--much of its activities focus on recruiting kids. The page itself begins with the phrase "Destiny Has Begun!" --a codephrase commonly used in "Joel's Army" circles to denote the "generation of destiny" (the new rebranding of "Joel's Army" borrowed from an Assemblies-linked church in New Zealand, now that the press is starting to catch onto the "Joel's Army" branding). "Destiny" in and of itself is a favourite codephrase in these circles--in "Joel's Army" theology, people are "destined" to inherit all manner of wealth and take over the planet and whatnot. I also found some publicly available videos about JCC's "Ground/Zero" youth program through a rather circuitous route that I won't post here to protect the privacy of people in the videos that lead me to believe that more goes on here than what is described in the application. groundzero - the center of rapid or intense development or change. Our name speaks our purpose. At groundzero we have a vision to develop youth that are marked by purity, passion, and the presence of God. This vision exists to create young people that will carry groundzero as a movement, not just a meeting. ground/zero is not a place, it's not a time, but it is a movement transported by people that will impact this generation with a message that instills hope and a purpose. The movement meets Wednesday nights. Doors open at 6:00PM and service begins at 6:30PM for Middle and High School service. Doors open at 8:30PM and service begins at 9:00PM for University service (ages 18-26). Seeing as it's actually been established through some quite official sources that Juneau Christian Center is an Assemblies church, that means that at least $25,000 of Alaskan taxpayers' money may have gone for active efforts to convert Alaskan teenagers to "Joel's Army" theology. Possibly some of the more damning info yet on Palin's membership in "Joel's Army" comes from the recent revelations of Palin's speech to a group called "Master's Commission". The full transcript of her speech has now come out, and it's actually worse than the initial reports of her claiming that Gulf War II was a holy crusade. But, um, so, having grown up here, and having little kids growing up here also, this is such a special, special place. The Assembly of God here has been a real center point in the Valley for all these years, and the Valley has been a center point for the state of Alaska. So what comes from this church I think has great destiny. And I say this to the Master's Commission students who have been here under this umbrella, who are going to be sent out now and bringing people in. I just want to bless you, and oh, because I didn't know if I was going to get here tonight, I flew in from Juneau last night and I fly again to Juneau tomorrow. So I didn't prepare anything, thinking my schedule wouldn't allow me to be here. But I have a word, but really I'm cheating 'cause it's a, I think it was given to me today but I'm going to give it to the Master's Commission students because I think it's so applicable to they are headed. And this word was given to me, bless his heart, by Pastor Ed Kalnins this morning at our big Valley-wide church service. It was called Ephesians 1:17, and this is what I want to pray over you guys too: that the God of our Lord Jesus Christ, the Father of Glory, may give to you a spirit wisdom and of revelation in the knowledge of him, and that spirit of revelation also including a spirit of prophecy, that God's going to tell you what is going on and what is going to go on, and you guys are going to have that within you, and it's just going to bubble up and bubble over and, and it's going to pour out over the state of Alaska. Again, good good things in store for the state of Alaska. Let us pray for God's will to be done here, for all of your destinies to be met in this state. However, this isn't all of why this is disturbing. For the rest of it, you have to do a little bit of digging into Master's Commission itself. The efforts at whitewashing haven't been so successful with Master's Commission, as a fellow blogger has recorded, but even more enlightenment is found via some Google-massaging. There are a number of groups using this name (and a surprising number of them are Joel's Army connected, indicating this may be one of the "rebrandings" we need to keep an eye on), but in this particular case, the "Master's Commission" we're concerned about is a post of an Assemblies frontgroup at Wasilla A/G that is connected to Phoenix A/G (Ted Haggard's present church). Whilst the main headquarters are now in Texas, the group did have its origins in the largest Assemblies church in the US (and one of the largest megachurches in the country). The group promotes itself as a "discipling and shepherding" group (which is bad enough), but the info on Wasilla A/G's site--amazingly, not yet redacted--is even worse. A preview of just how far we're going to be going into the rabbit hole becomes obvious on the website for Master's Commission North Pole (the state org--which, incidentially, has one of the most annoying Flash-based websites known). Aside from all the "sword" imagery and spouting off "destiny" every five seconds, it's let out that participants engage in "marathon fasting" of the type popularly promoted in Assemblies circles (which is to say, 21- and 40-day fasts with nothing but water, no food); in comparison, Lent just drops certain food groups, and Ramadhan only has daytime fasting. Such extreme fasts are considered quite unhealthy by medical personnel, and are seen as one major "warning sign" of a potentially abusive religious group. Have I also mentioned the fun of the group targeting Native Alaskan and Inuit communities for conversion? And this is just baby steps, really, compared to what we're about to dive into. Q: What sort of materials will I be taught? Of note, that "Berean School of the Bible" is the Assemblies of God's mail-order correspondence school--and the Assemblies tends to have particularly lax standards for ordination (you can get by with two good words from other Assemblies preachers, a multiple choice "Bible quiz", and two years of "ministerial experience" without setting foot in a seminary hall). Dream Center: You will be serving Rob and Cherise Hyslip who are taking on the vision of a dream center here in Wasilla. Like the one Pastors Matthew and Tommy Barnett have started in L.A., it is a shelter and resource for those facing homelessness, poverty, drug addiciton, and hopelessness. Ah, yes, Dream Center. :P Dream Center is one of several chains of "Faith Based Rehabs" that the Assemblies of God operates; in Dream Center's case, it is largely the Western District of the Assemblies promoting it, but it has spread to areas outside the Western District (such as Alaska). Past readers may remember Dream Center Phoenix as the site of Ted Haggard's so-far-unsuccessful degaying (he was ultimately dismissed from the program, as expected). And--much like other Assemblies-operated "faith based rehab" chains such as Teen Challenge and Mercy Ministries, there have been reports of abuse...some egregrious. Alaska has a divine destiny that has been spoken about by many church leaders and prophetic leaders from all over the world such as Dutch Sheets, Todd Bently, Steve Thompson, Woody Woodson, and Dr. Cho just to name a few. You will have an awesome opportunity here in Master's Commission Wasilla Alaska to partner with God as he is getting ready to pour out His Spirit like never seen before and cause a great awakening that will see millions all across our world come to know the Lord in a radical and intimate way. If this isn't a veritable "who's who" of modern Joel's Army promoters, I don't know what is. Listed prominently is Todd Bentley, who recently became the primary focus on a new Southern Poverty Law Center article on "Joel's Army" groups; also listed prominently is Paul Yonggi Cho (nee David Yonggi Cho), head of the largest megachurch in the world in Seoul and pretty much the "founding father" of Joel's Army stuff in the Assemblies--oh, yes, and there's always Cho's lovely connections to the party responsible for a particularly genocidal attempt to establish the Republic of Gilead in Guatemala. Steve Thompson is connected with Rick Joyner's Morningstar Ministries (and Rick Joyner is one of the names most consistently connected with "Joel's Army") and tends to show up frequently in reference material re "Joel's Army"; Dutch Sheets is a real piece of work and a major, major promoter of this stuff as well (in fact, he's also engaging in rebranding of "Joel's Army" as "Gideon's Army" on his end) with connections to "Joel's Army" promoter C. Peter Wagner. Woody Woodson is probably the most obscure of the lot--he's heavily promoted on the Assemblies "traveling pastor" circuit along with a number of "word-faith" promoters. In 1967 during the Alaska Purchase Centennial, Richard Peter wrote our Alaska State Motto. The motto is meant to represent Alaska as a land of promise. "North to The Future", we believe this is Prophetic; Alaska will be in the middle of a great outpouring. Yes, you read that right...apparently the state motto is seen as a prophecy of a giant tent meeting. I can't make this up if I tried. Compared to this, Palin's present congregation--Wasilla Bible Church--seems rather harmless. Unfortunately, appearances can be deceiving...especially with all the whitewashing of info critical of Palin going on. Wasilla Bible Church may not be Assemblies-scary, but it is definitely in the "SBC-level of dominionism, post-steeplejack" levels of "worrisome". Finding out any solid info in regards to Wasilla Bible Church has been difficult, because there's very little info on the church's website; it claims to be nondenominational, but some things like the Statement of Faith point to similarities to so-called "Independent Christian Churches" (which, in the case of the megachurch variety, trend dominionist). And an early, non-purged Internet Archive version of Wasilla Bible Church's page already turns up, as early as 2003, links to Focus on the Family--and both WBC and its parent church, as we'll see, are closely connected to FotF. The linkage continues to the present day--in the most recent church flyer I've been able to find online, a Focus on the Family frontgroup called "Love Won Out"--which promotes the "degaying" bogosity--is actively promoted. We actually tend to find more revealing info at the parent church of Wasilla Bible Church--a Palmer, Alaska church by the name of Lazy Mountain Bible Church. Again, there's an almost-deliberate attempt to hide where the origin was (all that is noted is that people apparently came to Alaska to found the church at some unidentified date, no bios on the pastors, no nothing)...but there are some indications of a potential neopente bent, and a definite dominionist bent. One surprising thing that I did find in research was apparent promotion of a popular women's writer in SBC circles within Lazy Mountain's church newsletter; in the same newsletter, though, we also find more promotion for that FotF frontgroup conference. Another thing that pinged my radar--and may give a clue to the true denominational affiliation of WBC and its parent--was the discovery of a "Potter's Group" course. This raised my alert, in part, because some highly abusive "Assemblies daughters" tend to use this imagery (including the "Potter's House" group). The application also gives hints of a potentially neopente group--it is in fact very similar to the form Matt Taibbi filled out to attend weekend at John Hagee's "Jesus Camp for Grownups" that turned into a literal vomitorium. (One of the giveaways we may be dealing with neopentes: one of the questions asked re abuse is a history of "Satanic Ritual Abuse", something that is pretty much only taken seriously in neopentecostal circles and which has been pretty well thoroughly debunked elsewhere.) Interestingly, it is one of the few applications for joining a cell-church group that I've seen that includes an indemnity form. An Adult Sunday School Class featuring Focus on the Family's The Truth Project meets at 9:15 a.m. on Sunday mornings in room #11. The class is facilitated by Jonathon Peters, Doug Prins and Ed White. A Truth Project Discussion Group will meet on Wednesdays at 7:00 p.m. in the home of Ed White. This is open to men and women. The particular speaker that LWBC had from ADF is also particularly damning--and disturbingly in-line with Palin's past history. Chuck Lane, in addition to being a regional ADF head, also has connections with Campus Crusade for Christ (yes, the same Campus Crusade now linked to attempts at military steeplejacking and coercive tactics aimed at college students, among other fun things--yes, the same Campus Crusade that runs the "Fellowship of Christian Athletes" that Palin held membership in, the same one that is practically joined at the hip with the Assemblies) and Promise Keepers (the infamous dominionist "men's org" that came into controversy because of its use of abusive "cell church" tactics; to this day, Promise Keepers is still listed as a coercive religious group by some exit counselors). "Judgment is very real and we see it played out on the pages of the newspapers and on the television. It's very real. When [Brickner's son] was in Jerusalem he was there to witness some of that judgment, some of that conflict, when a Palestinian from East Jerusalem took a bulldozer and went plowing through a score of cars, killing numbers of people. Judgment -- you can't miss it." And yes, this is the same "Jews for Jesus" that is almost universally considered a coercive religious group because of deceptive recruitment tactics--as documented by many independent researchers and exit counselors (in fact, the last exit counselor noted got into exit counseling due to attempts by Jews for Jesus to recruit his grandmother when she was in a nursing home). And this is still not all. Apparently, WBC's pastor has pulled his own version of a John Hagee foot-bullet--claiming in a sermon that America is due for a smitin' due to "rampant immorality". So...yeah, Wasilla Bible Church are definitely not angels here. And it's not entirely accurate to say that WBC is her sole congregation, either. Some media reports have indicated she may be attending both WBC and Juneau Christian Center--though there's definitely some ongoing spin on that. On Monday, the church had another cause for notoriety. Kroons told NEWSWEEK that Palin's campaign staff had contacted him that morning to ask for his discretion when discussing the pregnancy of Palin's teenage daughter Bristol. "All I'll say is that Bristol is a young lady. We care about her and want to support her and the family," Kroons said. Ashley Brown, another pastor at the church, said he'd also been contacted by the campaign with the same request. All the more reason, methinks, to keep shining that million-candlepower light in Palin's direction. Dogemperor, thanks for your excellent work on this! Your early leads have been very useful now that much of the material is being scrubbed. 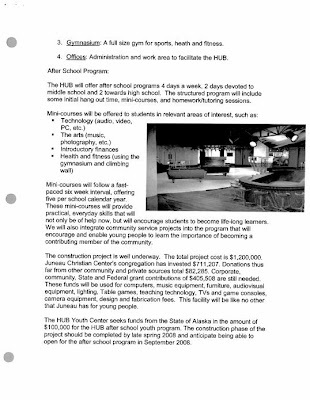 I saved a copy of the letter sent by Juneau Christian Center to the city council with their request for funding for the Hub, and also saved a copy of the picture of Palin visiting the center. This is ploy that is being used all over the country. These groups get federal funding for a youth center and this replaces the need for public community facilities. Then youth are forced to go to these aggressively proselytizing places if they are going to be able to socialize or participate in activities. In one place that we lived they began holding public school functions and events at a local megachurch. Youth pastors from this church would sit in the lunch room everyday talking to the kids and trying to get them to attend functions.